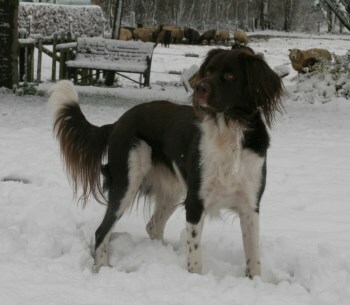 My husband and I are lovers of dogs, especially of the Dutch Partridge Dog (Drentsche Patrijshond). Until recently we had two of these, Balou (eleven years old) and Floran (four years old). 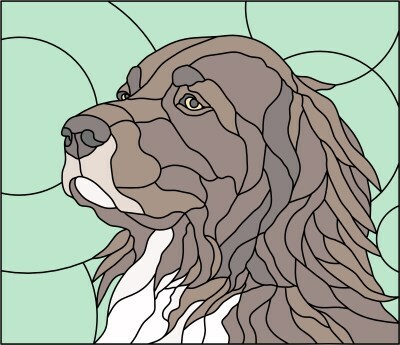 I wanted to make a Tiffany panel of a dog, but of course it had to be a "Drent." On the internet I have seen many beautiful dog designs, but never one of our favorite breed. Because of this, I decided to take our dog Balou as an example and make a Tiffany design with the aid of Glass Eye 2000. Among the Dutch breed, the Dutch Partridge Dog holds a prominent place. 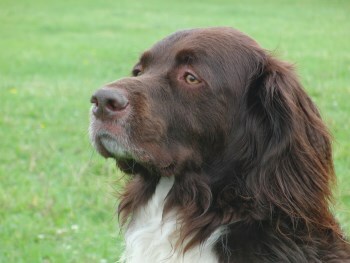 It is an ancient breed that has been held in high esteem in the Netherlands for centuries. After 1565 in the thinly populated moorlands of the Netherlands, dogs brought here by Spanish armies mixed with our native dogs, creating a new breed: the Dutch Partridge Dog. During several centuries of hard life in and around the farmsteads in Drenthe, this dog became a real jack-of-all-trades: family dog (friend to all), yard dog (protecting home and family) and hunting dog (pointing and retrieving during the hunt). It took me some time to make the design. At first I tried to apply a lot of detail, which made it very difficult to capture it in glass: too many small pieces. While working on the panel, I frequently made changes to the design. The panel has a very special value for us, because two months after I finished it Balou died unexpectedly at the age of 11½. I have always been fond of glass objects and everything made of glass. When my horse died four years ago, I decided to take a Tiffany workshop to divert my thoughts, and from then on working with glass has become my passion. Until now I have given away my creations to family, friends and especially my grandchildren. Balou is the first project I made for myself. Not long after I started with stained glass four years ago, I came across the free trial of Glass Eye 2000 on the internet and downloaded it. After playing with it for a week I bought the software, and I am still enthusiastic about it. 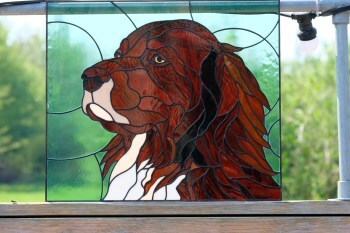 It is very helpful for designing stained glass projects, especially if you have a photo to start with. Without this program it would have been a lot harder for me to make this beautiful design. Lia van 't Ende and her husband Rob are living on a farmhouse in the middle of the Netherlands. She has two children and two grandchildren. A big part of her time is occupied by horseback riding and training her other dog Floran. The remaining spare time she spends on stained glass projects. 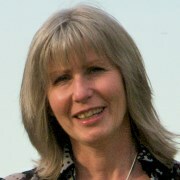 She started four years ago with a copper foil workshop, followed by a traditional lead workshop. Because she likes to work with attention to detail, she mostly focuses on copper foil techniques. Now she is working on her own ideas and projects, but she plans to work on other people's wishes and ideas soon, making customized stained glass. You can see more of her work on her Facebook page.